The summer of 2016 started out as a fun and exciting time for Kara Kennedy. She had just completed her first year of nursing school and had several activities planned with her new boyfriend, Dalton Parker. Kennedy and Parker planned for a fun day of hiking and adventure to a local tourist attraction, Bad Branch Falls located in Whitesburg, Ky. The two enjoyed the day and hiked approximately 1.5 miles. Kennedy recalls how beautiful the waterfalls were. Enjoying the view, Kennedy eased closer to the waterfall. As she stepped forward, her foot slipped directly into the current, causing Kennedy to fall approximately 70 feet. Parker rushed for help by running, the once hiked, 1.5 miles to a house where he called for help. First responders came to rescue Kennedy, who was taken by ambulance to a landing site atop Pine Mountain. There, she was airlifted to Pikeville Medical Center’s (PMC) Level II Trauma Center where she was unresponsive. Kennedy suffered from an open right femur fracture, hemorrhagic shock, right pneumothorax, bilateral rib fractures, dental fractures, acute renal insufficiency and right lower extremity compartment syndrome. Kennedy had 21 surgeries and procedures performed and survived cardiopulmonary arrest. She spent 35 days at PMC, with 21 of those in the critical care unit. 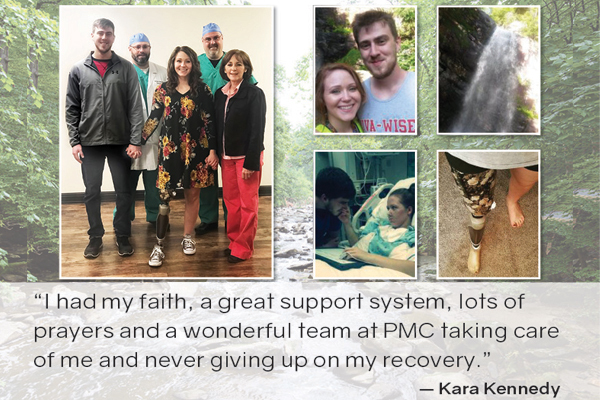 “I had my faith, a great support system, lots of prayers and a wonderful team at Pikeville Medical Center taking care of me and never giving up on my recovery,” Kennedy said. Since her accident, Kennedy is adjusting to life with a prosthetic leg, but grateful for her opportunity. Having a prosthetic leg isn’t slowing her down; she is running, walking, teaching gymnastics and is planning to graduate nursing school. Kennedy’s mother, Rose, commends PMC on the care they provided her daughter.